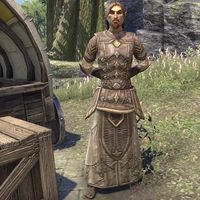 Vicereeve Pelidil is an Aldmeri Dominion diplomat. He can initially be found in Mistral, on Khenarthi's Roost, reluctantly working with the Silvenar to negotiate with the Maormer for control over the island. He is frank about his contempt for the quest for a peaceful resolution. Pelidil's End: Defeat a leader of the Veiled Heritance on the high seas. The Perils of Diplomacy: Uncover a plot to destroy Mistral. If he is spoken with in Mistral before being asked to help the Silvenar. "This diplomatic mission is a farce. The Dominion should've taken Khenarthi's Roost by force, and sorted the rest out later." You work with Prince Naemon? "I don't work with him. I serve him! As you should. The prince is your better, and serving him is serving the Dominion. Meeting him later in Vulkhel Guard before completing the local objective, he'll say, "Don't bother me, traveler. I must be ready to aid the Prince at a moment's notice." Vicereeve Pelidil: "Is the Silvenar blind? Every one of these Sea Elves is a venomous serpent waiting to strike! We should've cleansed this place of Maormer scum the moment we arrived." When you talk to him, his umbrage continues. "Lorkhan take them all! Why does the Silvenar negotiate with these filthy Maormer?" What do you have against Maormer? "Those pirates are a stick in the High Elf eye! They capture our merchant ships and raid our settlements. If I had any say, we'd negotiate with a sword at their throats!" You don't have any say in the negotiations? "Not as long as the Silvenar confuses diplomacy with capitulation! He's inside with the rest of them, pretending this won't end in bloodshed. Go, see this farce for yourself!" If you talk to him before informing Harrani of the Silvenar's death. "Mistral will belong to the sea itself before we hand it over to the Maormer! This entire summit is a waste of time." Pelidil: "The Silvenar, murdered? These treacherous Khajiit have plotted with the Maormer to slay our noble envoy!" Harrani: "How dare you! The Silvenar was our guest. You go too far, Vicereeve!" Ulondil: "Outrageous! More Dominion treachery. I will conduct my own investigation!" Pelidil: "No sea-rat will show me up. I'll get to the bottom of this myself!" "This is an outrage! I demand Ulondil be taken into custody!" Oh, never mind. It's like I'm speaking to a ship's mast. Do continue your "investigation," would you?" If you talk to him before confronting Ulondil about his part in the Silvenar's murder. After you confront Ulondil, the Maormer escapes. Ulondil: "The tempest is coming. You cannot stop it!" Pelidil: "Sea-rat coward! I'll have your head for this!" Green Lady: "I have his scent. And soon, his heart." Harrani: "Stop, all of you! This madness ends now!" Once your investigation has borne fruit, Pelidil is happy to have his preconceptions validated. "I warned them. Warned them! But why would I know anything about Maormer treachery? Maybe now they'll listen to reason. It only takes a murder, right?" "Such a waste of the Prince's time. That such a great man should be made to follow along after Ayrenn. Like a tamed hound! Naemon is no hound. He is a wolf." Talking to him before receiving the quest in the Elden Root throne room: "The prince is thoroughly engaged at the moment. Certainly too busy for the likes of you." After the Bosmer king directs you to talk to Prince Naemon: "You have business with the prince? Make it quick. I'll not have his time squandered on trivialties [sic]." "Andur has one of the little beggars in the field, away from the house." "Aranias will demonstrate her talents on the other." If engaged in conversation, he'll simply tell you that "I don't believe we've met. I'd prefer to keep it that way." This page was last modified on 8 April 2019, at 05:05.